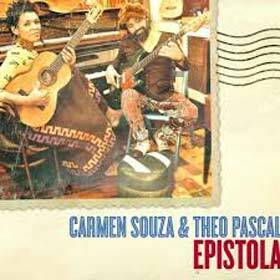 It is always prudent to approach any new music by Carmen Souza and Theo Pascal with great expectation quite simply because you never know what to expect. Theirs is truly the sound of surprise. The music on this disc, Epistola is no exception. Ms. Souza, the vocalist and Mr. Pascal, the bassist are ferociously gifted, firebrand virtuoso musicians, but with a mix of ardour and folksy whimsy. Carmen Souza more so, while Theo Pascal’s playing is more rooted in the jazz tradition, although the music he’s written here is solidly engrained in the sometimes moody and sometimes exuberant musical topography of the volcanic archipelago off the Atlantic Coast of Africa. This is a culture redolent of Sodade, that aching longing that informs its fishing ethos and yet it rocks with the polyrhythms of its African antecedents. Africa also gives Cape Verdean people resplendent vivacity and this, undoubtedly defines the mystique and magic of this album. The songs on the album are missives from the islands despatched in musical literature that is highly distinctive. You are at once struck by the creativity that comes from great invention. 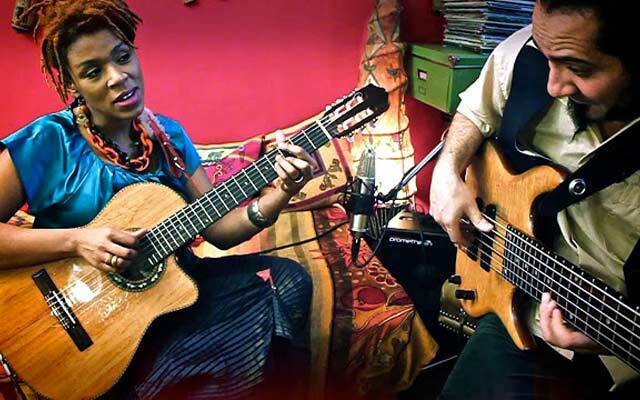 The lyric and music team of Carmen Souza and Theo Pascal are the architects of this unique idiom that is at once wrought from the explosive geography of Cape Verde and the sophistication of mainland Portugal and Britain that has also shaped the musical styles of Ms. Souza and Mr. Pascal. Usually something like this would come at a great price, but not with these musicians. They fire up the blues with syncopated lines that leap like graceful gazelles who have caught the spoor of summer rain. This is what comes not just from singularity, but also – especially as regards to the bassist – proof of sublime dynamics and articulation. And then there is the exquisite tempo as well. Carmen Souza has all the characteristics of a modern expressionist. Her personality and great strength is conveyed in her inimitable style. 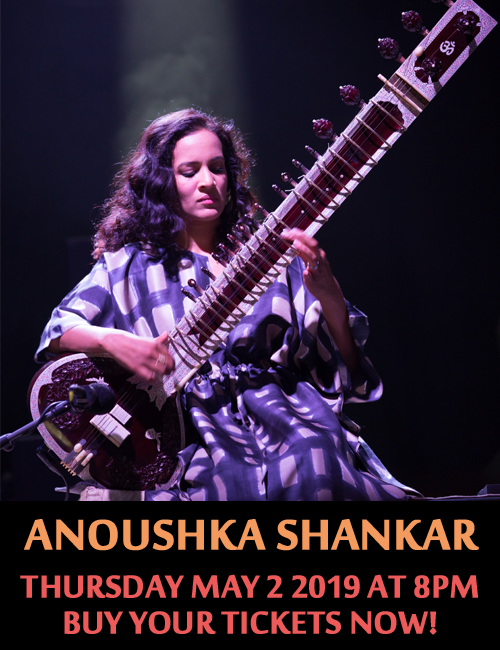 In moments when her voice starts to show its mileage two different voices are used – and this is evident in “Afro Monk”, for instance. One is aria-like sparkling as a gleaming gem and the other one that might suggest the gem in its rawer form – gritty, yet with intimations of great and priceless purity. I have rarely heard anything so luminous, so melismatic and so beckoning. Ms. Souza is truly one of a kind. Her reading of Horace Silver’s “Cape Verdean Blues” and Glen Miler and Mitchell Parish’s “Moonlight Serenade” that comes from both lyrical introspection as well as an insouciant spirit and freedom that comes from extensive experience of performing in the jazz idiom. Theo Pascal is one of the most gifted bassists on the planet. His mastery of notes is impressive, his command of an expressive elasticity shapes these notes. His pizzicato technique is virtuoso as is his con arco playing. Stark timbers define his playing especially in his continuo. Quaver octaves are clean and dramatically stressed from fz to p. Implicit in this is a sense of pleading which could turn on a dime to reflective nobility. His performance here is shaped by this kind of iridescence that is simply hard to find these days. It is truly a pity that he is not better known. His compositions and overall musicianship is very hard to find and when combined with the utter beauty of his virtuosity he becomes the rarest of rare commodities. I would be remiss if I did not mention the rest of the band. Drummer Shane Forbes and organist Matt King are up to the challenge of this music as is the reeds and woodwinds maestro, Craig Yaremko. But it is the young son of Mr. Pascal, Zoe Pascal, who plays on “Cape Verdean Blues” and “Mira – Me Miguel” who steals the show. There are young instrumentalists, and then there are fully-formed musicians, irrespective of the instruments they play. Zoe Pascal comes from the latter category. His playing is quite beyond reproach; the proverbial “chip of the old block”. In regards to the album, though, the group’s feel for imagery and poetry is legendary. This is a must-have disc, wherever you are. Track List: Cape Verdean Blues; Afro Monk; Kutequatekessa Quamundos; WPFL; Twenty Choices; Thursday; Oui ou non; Mira – Me Miguel; CV Railways; Stratheden Road; Moonlight Serenade. Personnel: Carmen Souza: acoustic piano, guitar and vocals; Theo Pascal: double bass and electric bass; Shane Forbes: drums; Matt King: organ; Craig Yaremko: saxophone and clarinet; Zoe Pascal: drums (1, 8).